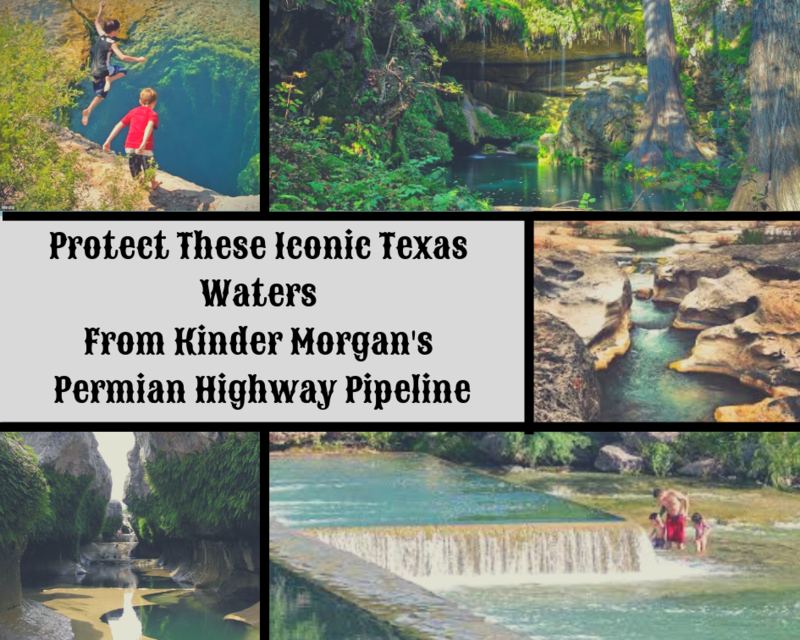 The Permian Highway Pipeline is slated to bore through the Texas Hill Country, abusing landowner rights and putting our fragile karst ecosystem in Danger! This campaign is matched up to $150,000! The Texas Hill Country is one of America’s most treasured landscapes. The proposed route cuts a 125-foot wide scar through hundreds of miles of private property, heritage ranches, rolling hills, the emerging wine country, peach orchards, sensitive waterways, endangered species habitat, and wildlife resources. This region should be honored for it's environmental and historic heritage. It is a Texas gem. Due to our efforts as a community, Kinder Morgan has finally vowed to only transport natural gas, instead of their previous option to switch it out for petroleum and other hydrocarbons. Even so, this does not alleviate our concerns. This is not clean gas like what comes out of your stove. This is dirty fracked gas. They are not even required to report what chemicals and hydrocarbons it is made out of. The inevitable leaks into our sensitive ecosystem and karst aquifers could have innumerable consequences to our water and our endangered species such as the Barton Springs Salamander. Kinder Morgan’s route goes right through the City of Kyle and the most rapidly urbanizing area in the country between Austin and San Marcos. Although it might be rare, pipelines do explode, sometimes with fatal and devastating consequences. 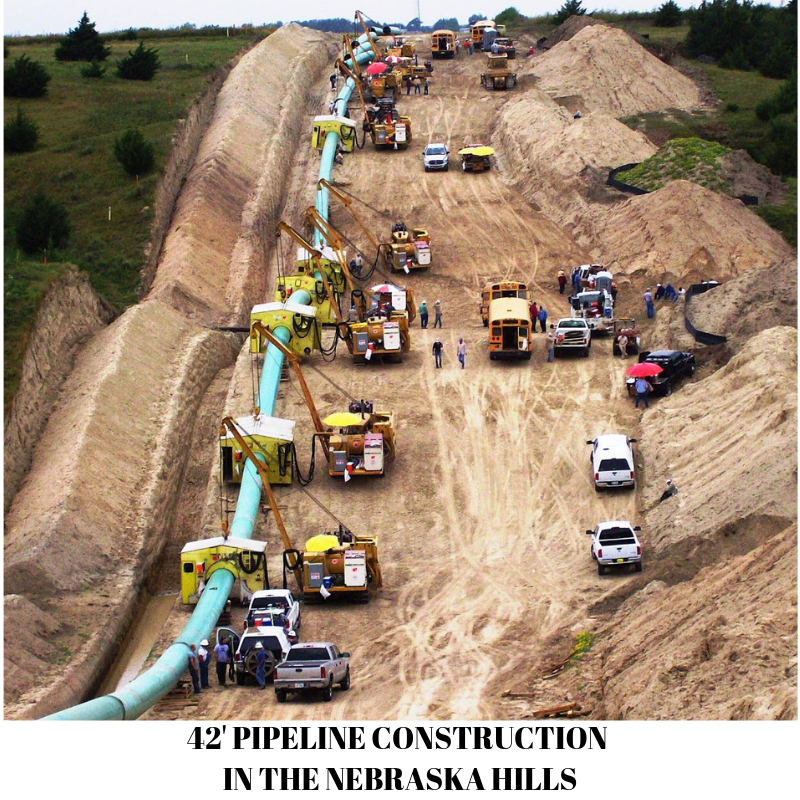 For this pipeline, the evacuation area will be 1.4 miles in diameter. This pipeline route will be going right next schools, neighborhoods and many other areas that should never be put at risk. The Permian Highway Pipeline threatens the invaluable water and wildlife species that we hold dear in the Hill Country. Our artesian springs and rivers, such as Jacob’s Well, the Blanco River, the Pedernales River, San Marcos Springs, and Barton Springs could all be seriously impacted by both the construction, operation and the maintenance of this line. 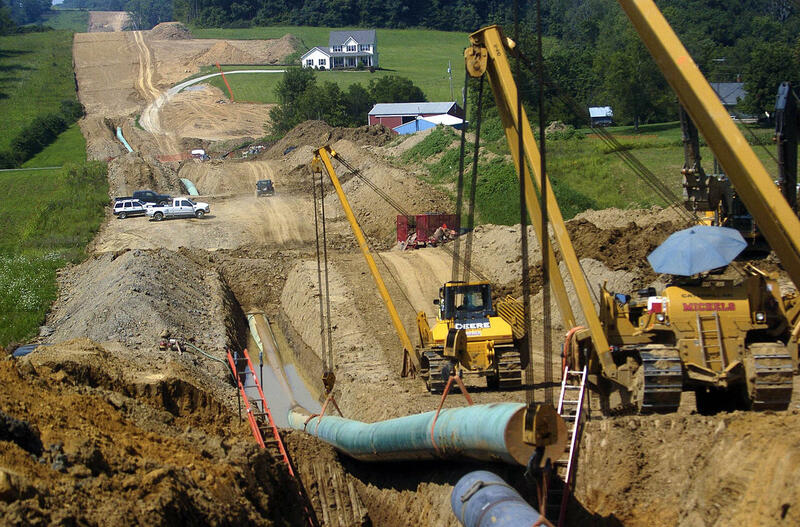 Kinder Morgan is using the power of eminent domain, which is supposed to be for public benefit, to take private property owners land to make this pipeline possible. However, this dirty fracked gas will be shipped overseas and will only be for the "good" of their shareholders. The Permian Highway Pipeline will generate an incredible amount of risk for our communities by transporting 2.1 billion cubic feet of gas - all for Kinder Morgan's profitable gain. The funding that we raise will help us to continue to employ the best environmental experts, and continue to harness the power of our community to take direct action with a unified voice. WVWA has been working hard to protect Hill Country watersheds for the last 23 years and all the resources, networking, and partnerships that we’ve made in that time have made us more than ready for this fight. This pipeline cannot happen and will not happen here - now, or ever in the Texas Hill Country! Be sure to visit the WVWA website for more information and to sign our petition against the Permian Highway Pipeline. Thank you for standing in solidarity with the Texas Hill Country. Landowners - THIS MONDAY is your chance to have a say in the Eminent Domain process! in the Senate Chamber. Landowners Needed to Support this Bill! and can have their question answered. 2) Stipulate minimum protections that must be present in the contract. to enter your support of SB421 and/or testify to the Committee. 3585 for more information, and to RSVP for this important event! 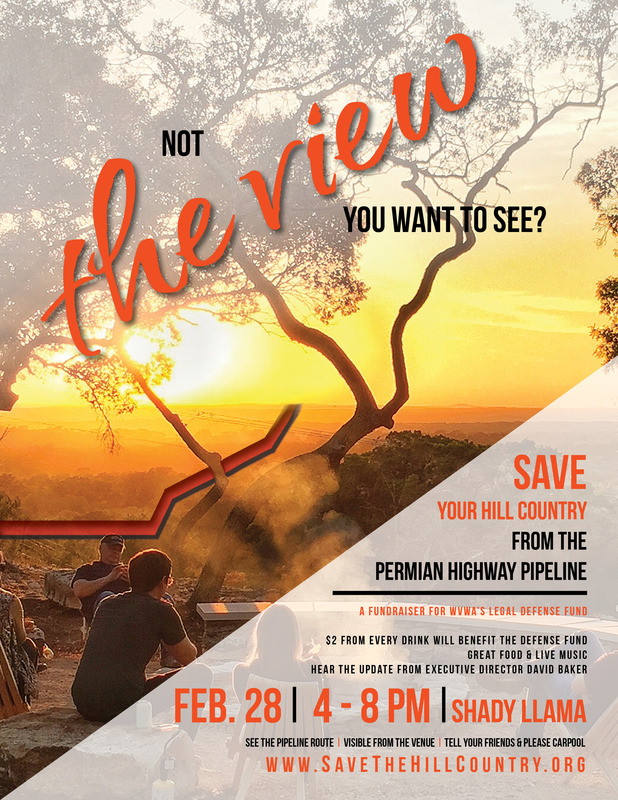 We at the Wimberley Valley Watershed Association have been working hard in every way we can to protect our beautiful Hill Country from the Permian Highway Pipeline. We have been reaching out to city and county officials and encouraging them to pass resolutions in opposition of the pipeline. We are also forming a coalition of local businesses in opposition. 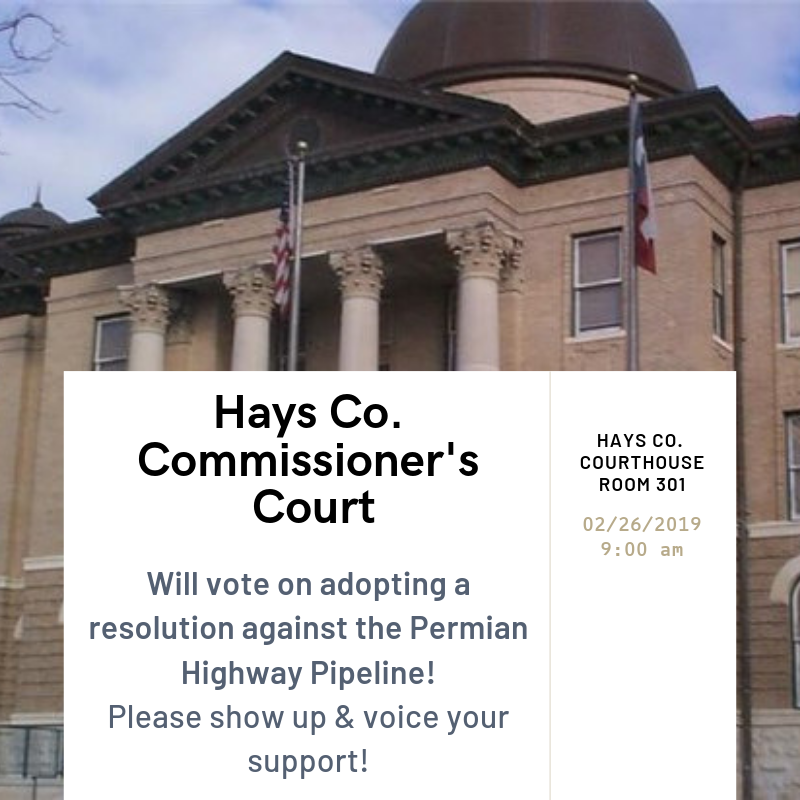 Tomorrow morning, the Hays Co. Commissioner's Court will vote on adopting a resolution against the Permian Highway Pipeline out of concern for their citizens, the environment, and our economy. Please consider emailing the commissioner's with your support or showing up in person. We will have yard signs and stickers to hand out to people and business owners at our upcoming benefit at Shady Llama Beer Garden in Wimberley on this coming Thursday February 28th! Tell your Friends, See you there! We Are Off to a GREAT Start! Thank You! This is truly a grassroots movement to protect our homeland from massive devastation by a corporation whose only motive is to make more money at our expense. 40K is a great start! However, we still have a long way to go... We estimate that Kinder Morgan has a 50 million dollar legal budget. Our minimum estimate for the budget we need to enact the legal strategy that will defeat them is 300K. If we can get 10,000 Texans to give $10, we will reach our goal. We Need YOUR help! Please spread the word to your friends, tell them how important this and urge them to donate. We have organized a great event at a beautiful venue, The Shady Llama, which has great views of the pipeline route. They feature beer and wine from around Texas and are graciously offering to donate $2 from every sale to our fundraiser. We will have yard signs and handouts for folks at this event! Tell your friends. Drink Responsibly. And please CARPOOL. We are doing everything in our power to get this pipeline out of the hill country. We will fight to the very end for you! The Wimberley Valley Watershed has been serving the Texas Hill Country for the last 23 years. Our mission is to ensure that communities are aware of their connection and responsibilities to the watershed and are supported in implementing water policies and practices that will ensure ecological sustainability for generations.